Vantara, Hitachi's new Internet of Things + analytics business, has sped up its operational and disaster recovery chops, claiming to elevate IT with always-on data availability. Hitachi's publicists have clearly been attending the always-on buzzword availability website and there's a distinct echo of Veeam's marketing pitch in Vantara's launch. 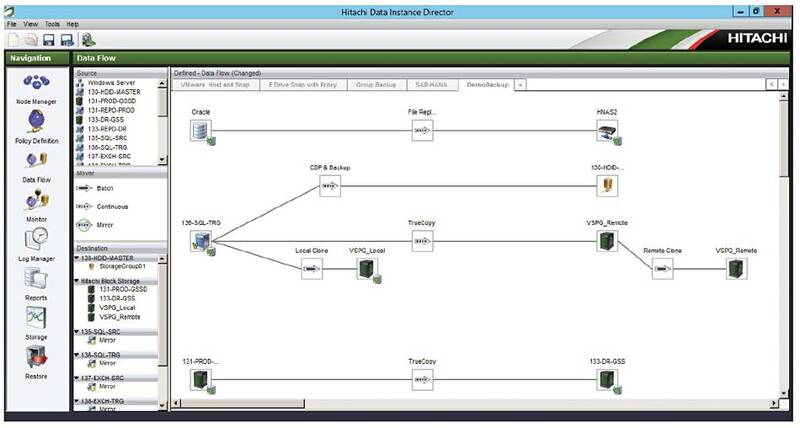 Hitachi Data Instance Director (HDID) v6 matches how rocketship-growth backup company Veeam positions itself as providing availability for the always-on enterprise. HDID uses snapshots, clones and replication on HDS storage arrays, not application server hosts, to protect production data and make it available for recovery. It is based on AIMstor, a product supplied by Cofio Software, which was acquired by Hitachi Data Systems (HDS) in 2012 and has, obviously, been much developed since. AIMstor also had a workflow manager with settable policies for scheduling the operations it controlled. HDID v6 workflow GUI. Click to enlarge. HDS developed this into HDID's whiteboard-like, workflow-based, policy engine. In the last few months HDS was amalgamated with Pentaho Software and the Hitachi Insight Group into Hitachi's Vantara business unit, which is focussed on IoT. With all this in mind, Vantara said HDID v6 "significantly modernizes IT environments and how data is protected. This newest version improves data availability – a requirement for transforming an organization into a modern digital enterprise – by supporting always-on service objectives." Sigh. With HDID v6, applications get operational recovery, business continuity, disaster recovery and copy-data management capabilities. For cloud service providers and enterprises, there is a REST-based API, granular role-based access controls and multi-tenancy support. Operational and disaster recovery can be delivered as a service via the API, as can the copy data management. Supported storage products are Hitachi Virtual Storage Platform G series, F series, NAS module, Hitachi NAS Platform and Hitachi Unified Storage VM. Vantara's SVP for market development and product management, Iri Trashanski, claims HDID v6 delivers "fast and frequent protection with virtually no impact on production applications as well as near-instant local and remote recovery." It is claimed to eliminate backup windows and storage volumes can be locked to help resist and defeat ransomware.